South Korea’s leading mobile operator SK Telecom on Wednesday opened one of its first commercial fifth-generation base stations in the central area of Seoul, showing confidence in the planned commercialization of the world’s first 5G services in March. SKT introduced a 24-kilogram rectangular active antenna unit for the 3.5-gigahertz frequency band -- 1 meter in height and 23 centimeters in width -- installed at the rooftop of a small hotel building in Myeong-dong, one of the most crowded areas in Seoul. Compared to the fourth-generation Long Term Evolution antenna units hung at the rooftop railing, the 5G antenna unit consisting of a total of 32 individual antennas looked noticeably smaller and more compact, requiring just 10 square-meters of space for installation. The equipment was manufactured by Samsung Electronics, one of three vendors chosen by SKT for 5G. 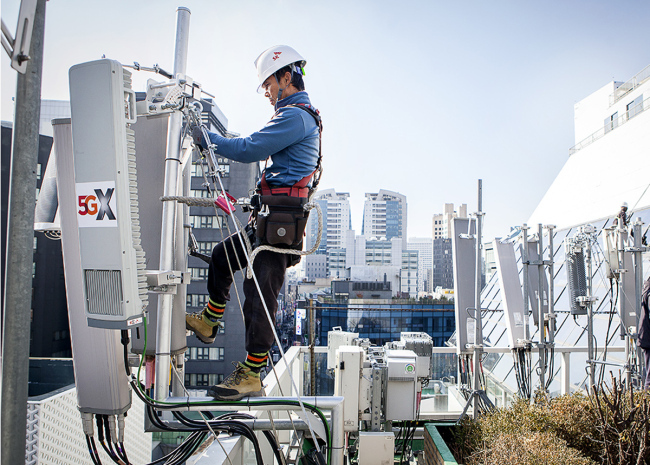 “Because 5G services require more than double the number of base stations of the current 4G base stations, we requested our vendors to build the equipment as compact and small as possible,” said an SKT engineer. The telco is deploying equipment made by Samsung in the Seoul metropolitan areas. Nokia’s equipment is being installed in Jeolla Province, Gangwon Province and Jeju, while Ericsson’s is being allocated to Busan and southeastern parts of the country. The 5G AAU features SKT’s proprietary beamforming technology that transmits radio signals for a particular target area for stronger and faster wireless communication, and multi-user multiple input and multiple output technology, known as MU-MIMO, which allows multiple users to use various devices simultaneously at the same speed. SKT plans to hold a ceremony on Dec. 1 for the first transmission of the 3.5-GHz 5G frequency at the Myeong-dong base station. Details of the event have not been confirmed. Korea plans to commercialize the world’s first 5G service via mobile routers by Dec. 1 and to launch completed 5G services by March.